She's a supermodel who came from humble beginnings, but is she really hypoallergenic? 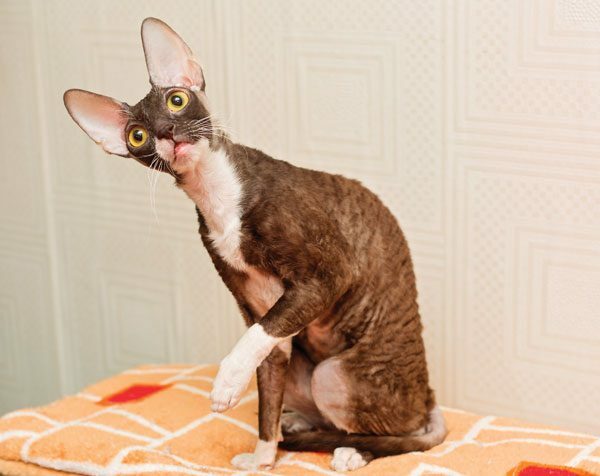 The Cornish Rex has legs up to her neck, high cheekbones, and an enviable curly ’do. You might think of her as the supermodel of the cat world, but this beautiful creature has far more going for her than looks alone. 1. Is that a Marcel Wave? Good eye! Popularized in the 20s and 30s by flappers and Hollywood film starlets, the Marcel Wave required hot curling tongs to induce a stylish curl into the hair. No tools are necessary for the Cornish Rex, however. The wave is a trait from birth, which gives the coat, along with the eyebrows and whiskers, a noticeable, close-cropped curl that’s soft to the touch and forever elegant. The Cornish Rex coat has drawn comparisons to rabbit fur, karakul lamb, chenille, velvet, suede, and silk. Though reminiscent of all of the above, nothing compares to the feel of a true Cornish Rex coat. 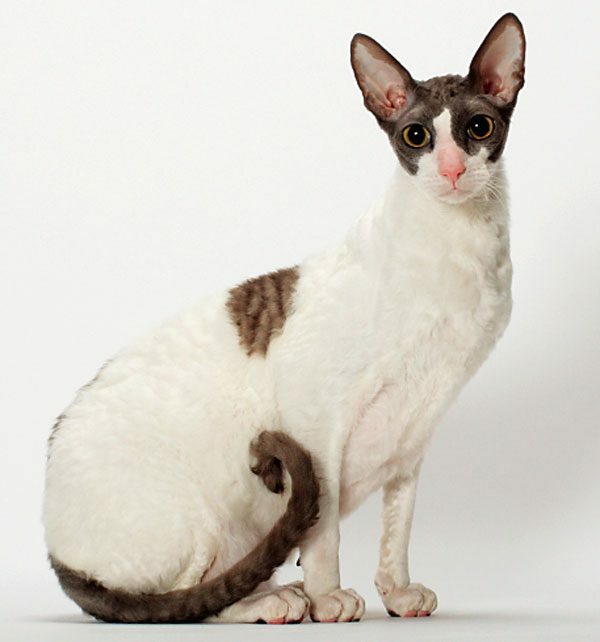 Though the curly coat is obviously an eye-catcher, the Cornish Rex has been known to turn heads due to her egg-shaped head, Romanesque nose, high cheekbones, large, bat-like ears, and hollow cheeks. But that’s just the tip of the iceberg. Her small waist, legs for days, arched back, and barrel chest make the Cornish Rex destined for the catwalk. Born to a nondescript barn cat, the first Cornish Rex, named Kallibunker (Kalli), was the only curly coated kitten in the litter — a natural mutation. At the advice of a geneticist, once Kalli reached maturity, he was mated back to his mother, producing a litter with two curly-coated kittens. To create genetic diversity, the kittens were outcrossed to domestic cats, along with Russian Blues, British Shorthairs, Havana Browns, Siamese, and American Shorthairs. Definitely not. 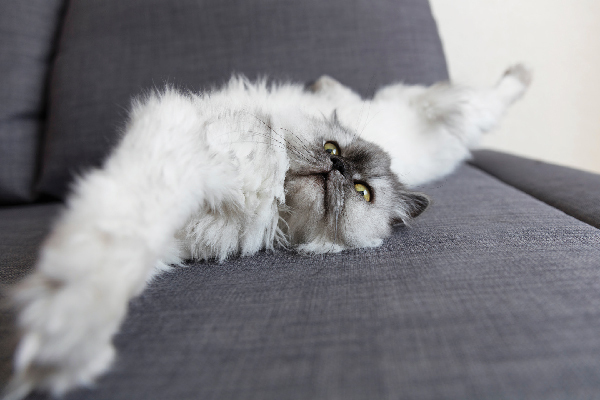 There are no truly hypoallergenic cats; however — and this is a huge plus — the Cornish Rex is considered a great choice for those with allergies, as they don’t provoke them as much. Where did the moniker Cornish Rex derive from? Cornwall, England! The first Cornish Rex appeared in 1950, sporting a coat similar to that of a Rex rabbit. 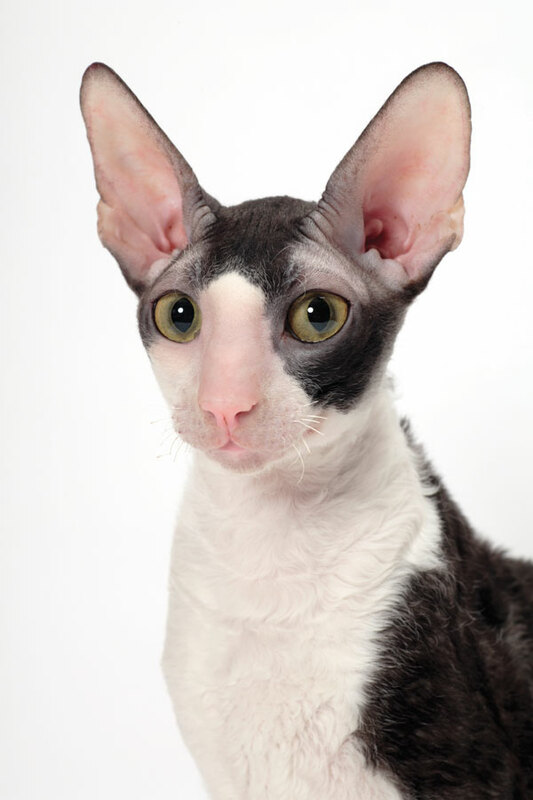 Thus, the breed was dubbed a Cornish Rex. Though females, on average, weigh 5 to 7 pounds, and males, on average, weigh 8 to 10 pounds, the Cornish Rex is muscular, solid, and hard-bodied. She’s famous for her high jumps, quick starts and stops, and fast turns — all of which have earned her comparisons to the Greyhound. Athletic, playful, outgoing — the Cornish Rex is all of the above. Eager to play a game of fetch? She’s down. Looking for a companion for your travels and road trips? She calls shotgun! Want to add a feline companion to your growing family who will get along with everyone from kids to dogs to party guests? She’s your girl! A highly intelligent breed, the Cornish Rex is always looking for a challenge and loves to play puzzle games. She’s always ready to learn something new, but don’t be surprised if she teaches you a few things in return. Fetch and catch are favorite games of the Cornish Rex. No one around? No problem! She’ll use her agile paws to not only pick up small objects, but toss them in the air for herself to catch! The Cornish Rex is highly versed in body language. A flick of the tail, a glance, a kiss on the cheek — she knows how to get her point across with minimal effort. As a social breed known for a sense of humor, the Cornish Rex will do anything for a showering of attention or round of applause, and that includes partaking in a vocal parry with her nearest and dearest. Will she walk around shooting the breeze or gossiping? Not likely. She’s more of a ‘do it for the likes’ type of vocalizer. Though not a lap cat per se, the Cornish Rex does love to hunker down on the lap of just about anyone when she feels inclined — a tempting trait that makes her an excellent therapy cat. your bed — she likes to hunker down under the covers. 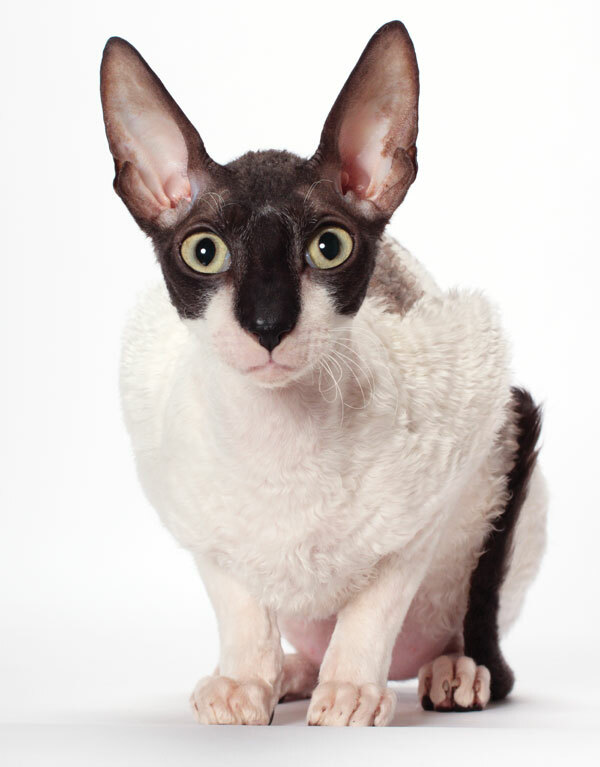 Throughout the 1950s and 60s, the Cornish Rex gene pool was so small that it was dubbed an endangered breed! See more breed profiles on Catster. About the author: Writer and blogger Erika Sorocco fuses her love for felines and fashion in the blog Cat Eyes & Skinny Jeans. She shares with her cats Minky and Gypsy. Follow Erika on Twitter at @cateyesskinnies.